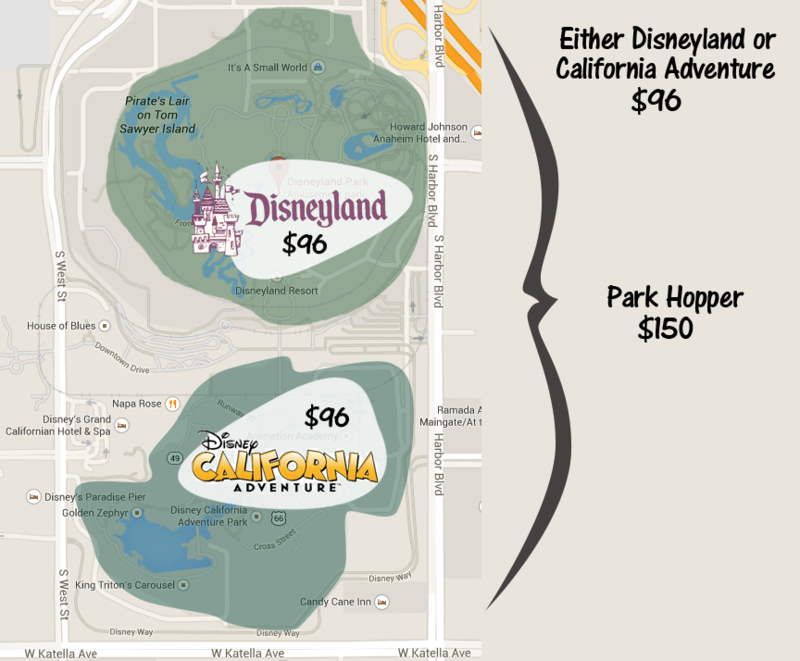 Should You Buy Park Hoppers at Disneyland? No. When a second park opened up next to Disneyland, they started selling Park Hopper tickets. Park Hoppers are special, premium tickets which allow guests to visit both Disneyland and Calfornia Adventure on the same day. 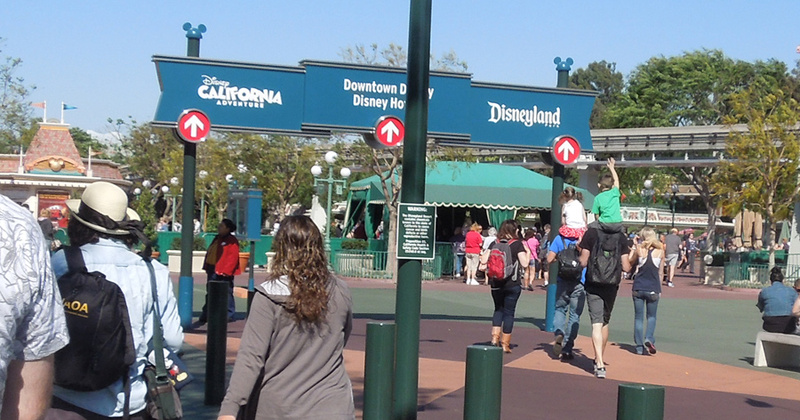 With a park Hopper ticket, visitors can hop back and forth between the parks, at will. This is a great sales pitch, but a ticket to visit both parks on the same day is not as great as it might seem. Here's why: Both amusement parks are packed with attractions. There are enough rides and shows at Disneyland to keep you entertained for several days. California Adventure is similarly packed with things to do. The existence of a park hopper ticket might tempt you into thinking that sampling the best of both parks is better, but it isn't. Just choose one park, either park, and you will be happy. I promise. Your day at Disneyland is limited. Not just by the operating hours of the park, but by your own physical endurance and capacity for fun. 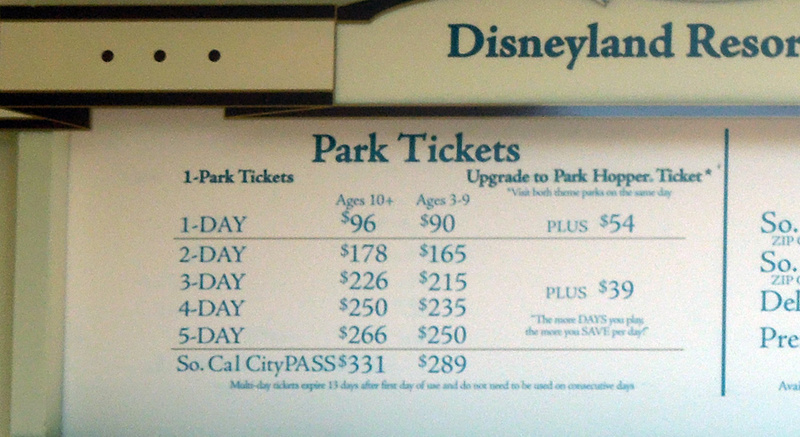 I think I could present a strong argument against Park Hoppers without mentioning the price difference, but here it is: This year, 2015, regular, single-park tickets for an adult to Disneyland or California Adventure are priced at $96. Single day park hoppers are priced at $150. $54 more, per day. My favorite mental exercise is to try to come up with the perfect comparison for a new situation. I tried to find one for park hoppers. 1. If regular tickets are like having a gift certificate for $100 at Macy's, park hoppers are like $100 gift certificates that can be used at Macy's OR Best Buy, but they cost $150. 2. If regular tickets are like a filling your own $1.00 drink at the soda fountain, park hoppers are like paying $1.50 for the same size cup, but with an option to mix up the different soda flavors however you want. 3. You are at See's Candy, trying to fill a $15, one pound box of chocolates with 16 candies. They offer the option to choose from their "Old Fashioned" selection of candies, for an additional $7.50. To me, two amusement parks are too much to enjoy in a day. When you buy tickets, you know the parks are right next to each other, but in actual practice, "right next to each other" is still a long walk. Each park, Disneyland and California Adventure, are set up with a trunk road entering the park, with the majority of thrill rides and attractions branching off from a central hub. 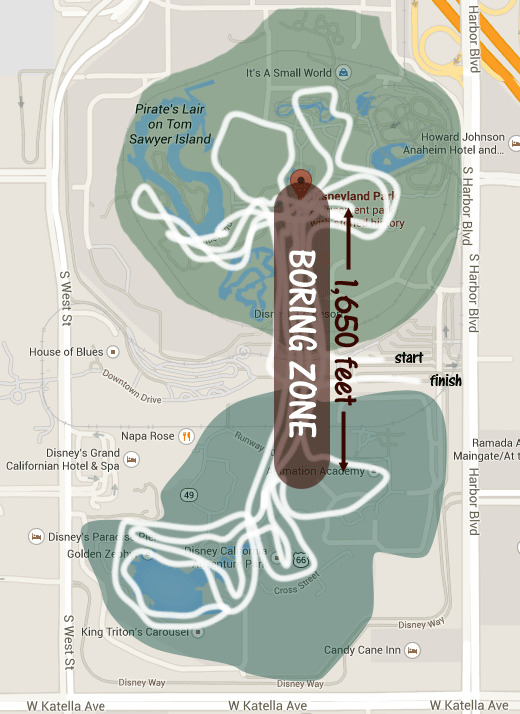 In the image, this area is marked "Boring Zone". Both central hubs have a statue of Walt Disney. The distance between the Walt statues is about 1,650 feet. That's the gap between having fun at Disneyland and having fun at California Adventure. Don't do it. Your feet are going to be aching at the end of the day. You might as well spend those pedestrian miles in the exotic walkways of Adventureland or the futuristic cement of Tomorrowland. Pick a park and stick with it.